It's always exciting to see young people get involved in our work to help struggling families in our community, and we are especially proud of a few who really took charge recently to make a difference for their neighbors. In February, W.T. 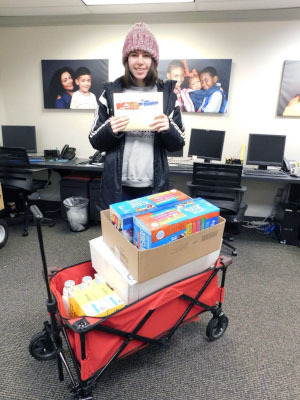 Woodson High School student Jesse Silkowitz delivered $740 in grocery store gift cards and 140 pounds of food, cleaning supplies and toiletries, valued at $240. 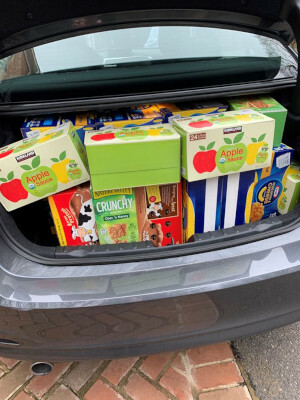 She had run a food drive in her Mantua neighborhood, and we are so grateful to Jesse and her generous neighbors and friends for helping us stock our Food Bridge Program emergency pantry at a time when we were running low on donations due to the government shutdown. Her goal had been to raise $1,000 in food and gift card donations, and she did it! Jesse and her family are long-time supporters of Britepaths, and her mom Joni Henderson is a member of our all-volunteer Board of Directors. The food, supplies and gift cards she collected are being distributed to local families in crisis who are referred to us for assistance, and they are so grateful for this support. The gift cards help them purchase fresh, healthy foods that meet their families' dietary needs to supplement the food and supplies they receive. Thank you, Jesse! Just in the nick of time! 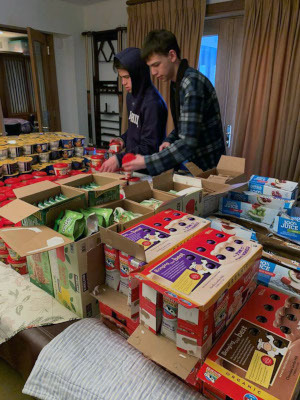 Brothers Julien and Luca from Flint Hill School recently purchased food with their family and packed 100 weekend food bags for local students in need at one of our Food4Thought Program Partner Schools. They chose to donate the packs to Montrose Alternative Learning Center, which had completely run out of food! It is hard to learn on an empty stomach. Our Food4Thought Program partners with Fairfax County Public Schools to help them ensure that students in need in their schools go home on Fridays with some extra food so they stay healthy and are ready to learn on Mondays. Thank you, Julien and Luca! Running a Food/Gift Card Drive and packing Food4Thought weekend food packs for kids are wonderful individual and group volunteer projects for community members of all ages that can be conducted on your own schedule. 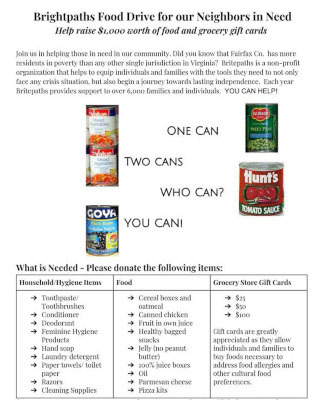 Food/Gift Card drives can be conducted in your neighborhood/business/community or by scheduling a drive at a local grocery store. All food for Food4Thought packs must be donated, but may be raised through a food drive or contributed through a sign up in advance of the packing. Do More for Your Neighbors! One of our Food Bridge Program's greatest on-going needs is for groups to serve as Food Bridge Supporters. These groups sign up for one or two Sundays during the year on our Delivery Calendar. They commit to raising the necessary food, supplies and/or grocery store gift cards and delivering them to up to 30 of our client families on that Sunday. Gift cards may be mailed in advance of the Sunday. Many local businesses, community organizations and faith communities find this to be a meaningful group volunteer project, and it makes a huge difference for our clients, who are working with mentors to budget, save and become financially self-sufficient. We still have MANY holes in our 2019 calendar. Please contact Christina Garris at cgarris@britepaths.org or 703.273.8829 if your group or organization can help us fulfill this important and greatly needed volunteer role. Britepaths’ mission is to provide our Fairfax County area neighbors in need with short-term safety-net services and empower them to work toward long-term self-sufficiency. Sign up for our newsletter to get up-to-date information. © 2019 Britepaths All rights reserved.